Fewer dog walkers etc than the river around Stony. More than half a mile of Upper Ouse north-west of Stony Stratford (West Bank). Chub to 7lb+, big perch, roach, bream, pike and the occasional good tench. 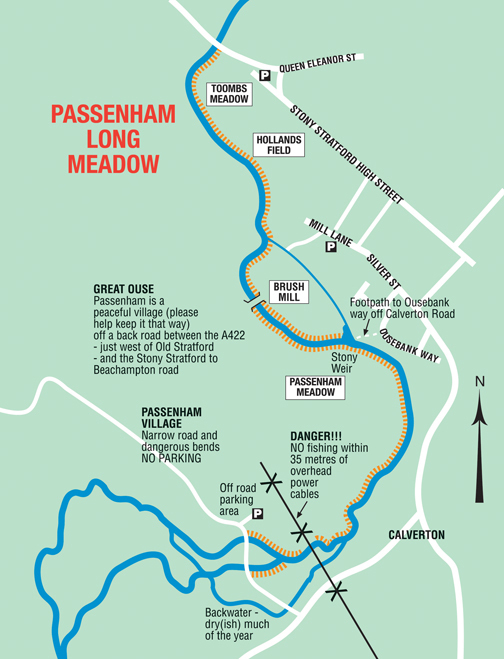 Access from car park just inside field gate at Passenham Village (signedParks Trust grazing land) where the river comes under the road - please keep the gate closed and do not obstruct the farmers access - or over the iron bridge on Brush Mill.